IV seen photos of Hyde Park flats I don't recall them personally as I was very young when they were demolished in the early 1990s . The complex looks massive and must have had great views from the upper levels . 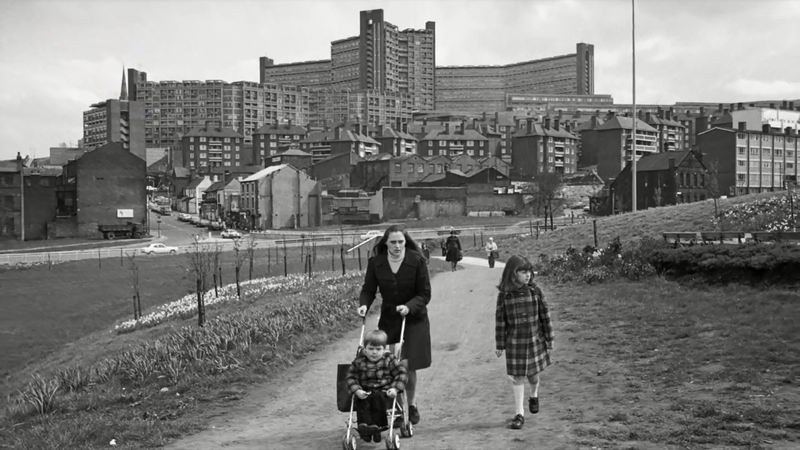 Was the flats inside similar to the ones at Park Hill flats and was their bedsits in the complex did the lager flats have three or more bedrooms.The outside looks similar to Park Hill but IV noticed on the very top the design looks different . Was it ture their were design flaws in the complex ? I never lived there but they had 'Penthouses' At least on the Duke Street facing side and they were at 'street level' which an oxymoron I think. Why were they an oxymoron? Penthouse only means a section of building with "a sloping roof". Did they not have sloping roofs ? No, I thought a 'Penthouse' (at least where I live, but not in one) was the uppermost living level in a block of buildings, and thank you Mr. M.
Hyde Park Walk and Terrace were commonly referred to as the penthouses. A few images here (with Park Hill School in the foreground), here (Hyde Park Terrace) and here (really interesting photo showing the old Park Hill school, and the Park Health Centre and Trades & Labour Club sites prior to redevelopment). Yes it really was an impressive sight. There was a great view from the Crucible across Park Hill with the Hyde Park 'citadel' towering above. If it was in London it would be the new Trellick Tower. That is the big question around Sheffield Town Planning. A World beating project one day becomes a demolition site within twenty or thirty years.